Mrs. Emma Dorothy Eliza Nevitte Southworth (1819-1899), Buffalo Electrotype and Engraving Co., Buffalo, N.Y.
After being abandoned by her husband, Emma Southworth began to write stories in order to supplement her income as a teacher and support her children. She used the pen name E.D.E.N. Southworth. Some of her earliest works appeared in The National Era, the Washington, D.C.-based newspaper that originally serialized Uncle Tom's Cabin. 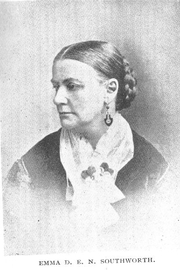 The bulk of her work appeared as a serial in Robert Bonner's The New York Ledger, which was widely read in the 1850s and 1860s. Emma Dorothy Eliza Nevitte Southworth is currently considered a "single author." If one or more works are by a distinct, homonymous authors, go ahead and split the author. Emma Dorothy Eliza Nevitte Southworth is composed of 20 names. You can examine and separate out names.